This moist and tender Zucchini Bread recipe is very flavorful; a great way to use up a lot of zucchini! This is a quick bread; that means the bread is leavened with baking soda or baking powder, not yeast. Quick breads are very easy to make, they keep well for a few days, and they are moist and tender. Zucchini adds great flavor and moisture to this recipe. It's made with granulated sugar and brown sugar for more flavor and moistness. You can use pecans instead of walnuts, and dried cherries or cranberries instead of the raisins if you'd like. To make the best quick breads, you need to follow a few rules. First, measure carefully, especially the flour. Spoon the flour into the measuring cup and level off with the back of a knife. Too much flour will make the bread dry and tough. Second, mix in the flour just until everything is combined. 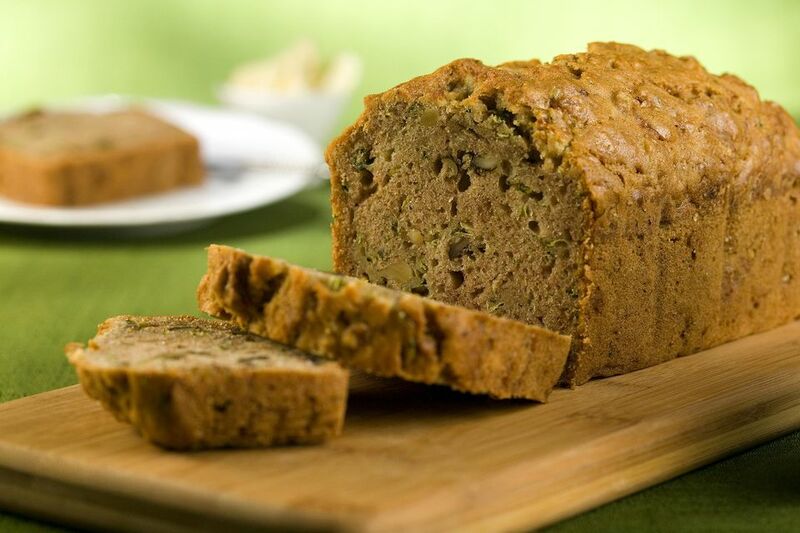 Quick breads don't need a lot of gluten, and beating these batters will develop that protein. And finally, bake quick breads until they are done. Quick breads should be deep golden brown and a toothpick inserted into the center should come out almost clean. Enjoy this easy recipe for breakfast, and use up your garden harvest! Preheat oven to 350 F. Grease a 9x5-inch loaf pan with unsalted butter or solid shortening, or spray with nonstick baking spray containing flour, and set aside. In a large bowl, combine the butter and sugars and mix well until combined. Add the eggs one at a time, beating well after each addition. Add zucchini, buttermilk and vanilla and mix well. Add the flour, baking soda, salt, baking powder and pumpkin pie spice to the batter just until combined; stir in nuts and raisins or currants. Pour the batter into the prepared loaf pan and bake for 55 to 65 minutes or until a toothpick inserted in the center comes out clean. Cool the bread in the pan for 5 minutes, then remove from the pan and cool on a wire rack. You can glaze this bread if you'd like; combine the powdered sugar and milk and drizzle over the cooled bread.